By now the message should be clear to all publishers; advertisers are not going to continue to pay high CPMs without appropriate, measurable ROI. The days when a website could demand high CPM rates for their content are long gone, even the so called "premium" sites aren't immune to this phenomenon. Any site who still believes that a marketer will spend premium dollar for a placement on their "premium" site without measurable return is nuts. Direct marketers don't care where a customer came from just as long as they have money and they're interested in buying. This is the main reason why PPC search advertising is so popular and valuable to advertisers. Performance is the name of the new game and any publisher who isn’t working tirelessly at improving the performance of their advertising inventory is going to foul out in the first quarter. In a recent report by Price Waterhouse Coopers done on behalf of the IAB, performance based online advertising pricing models were shown to have taken a clear lead in overall revenue share. 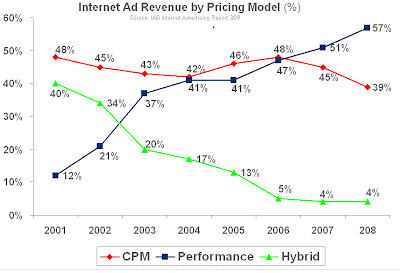 According to the report, 57% of all online advertising dollars in 2008 was spent on a performance based pricing model while only 39% was CPM based. Up to 2 years ago CPM based models were still in the lead, however the performance model share has been steadily increasing since 2001 and shows no immediate signs of abating. Any publisher that is still depending on above market CPM rates to support their business model needs to start rethinking their approach to profitability before the rug gets completely pulled from under them. In a 2009 ad effectiveness survey conducted by Forbes advertisers were asked to list the most effective online marketing tactics for generating conversions. Behavioral targeting was 4th on the list after SEO, email, and PPC/search respectively. CPM ads were listed 8th with only 10% of all respondents seeing then as effective. If this survey can be trusted as a true indication of advertiser sentiment then it’s no wonder why CPMs are falling fast. Marketers believe that behavioral online tactics are most effective because they provide the greatest bang for the digital advertising buck and ultimately the best performance. Behavior is the pathway to relevance and relevance is the only thing that will substantially increase online advertising performance. Publishers should be constantly trying to figure out how to mine their user’s behaviors to better target their advertiser’s ads and achieve greater relevance. Ignoring this trend is bad for business, specifically your business. So consider yourself warned. Act now or be completely left behind.